Has anyone had the experience of walking on a rope bridge? It is shaky and you need something to hold on to. Q. In your spiritual life, how can you stand firm? In Phil 4:1-9 Paul gives us 7 things to help us stand firm. 1. Relationships are important. In verse 1, he says that he loves and longs for them and that they are his joy and crown. In verse 2 he is pleading with Euodia and Synteche to resolve their issues. We looked at that last week. It is important to have good relationships in the body of Christ. It is not a small thing. One infection in your toe can cause gangrene and affect the whole body. People squabbling in the church is a Big thing. 2. 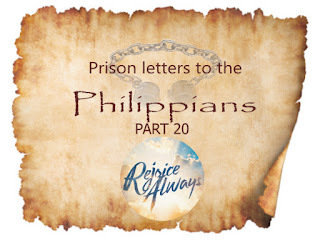 Rejoice: Paul is commanding the Philippians to rejoice. He is saying it again and again. Maybe your situation is not ideal but this is not an option. It’s not rejoicing in circumstances but in the Lord. the Lord is worthy of Praise. Joy is supernatural. It’s one of the fruits of the Spirit. Even when they were being flogged, they rejoiced. Grace of God was upon them. Our joy and well being is dependent on knowing who the Lord is and being filled with the Holy Spirit. Horatio- his family moved to Chicago to help those who were less fortunate. A year later, the family went on a ship and the ship sank. Hearing this, he went to see his wife who was the lone survivor. In the ship that was taking him to meet her he wrote the hymn, "It is well with my soul." He had every reason to be bitter, but he did something else. Q. How do we rejoice? 1. Contentment- we are incredibly blessed. We always want more and think our situation is bad. Our situation can always be worse. If you have a home, food, shelter, you are in the top 5% of the world. You are blessed and need to be content. 2. Remembering what Jesus has done for us. We are children of God- we pass through death like a doorway to enter heaven. No matter what you’re going through, he will be with us. 3. The sovereignty of God is a truth we need to hold on to. He is all powerful. The disciples in the boat- when the storm came by, Jesus was sleeping. The disciples were screaming. Jesus was woken up. He said, be still and the storm calmed down. The disciples marvelled. Jesus then rebuked them. He is in control. That is the great assurance we have. All the organisations in the world will come and go. The church is the only thing that will survive. God has given us something significant to do. Q. How can you change the way you feel? By changing the way you think. As we read the word, it gets into our mind. And even in a bad situation, we are able to rejoice. There is a place in earth that is the most peaceful place ever. It's called the cemetery! If you took the same number of people and placed them in the same room there will be misunderstandings. That’s the very nature of things. Babies are cute but they also mess. Dolls give no trouble. Proverbs 14:4 says Where there are no oxen the manger is clean. Where there are people there are disagreements. This is normal. We are all flesh and blood. As long as we are alive, we have opportunity to sin and be sinned against. Is it important to resolve these things? In Christian life, misunderstanding can and will happen. It's important how we handle it. Paul is in Rome a prisoner in chains. Paul is writing on important topics, those who want to go back to the law etc. to stand firm against persecution. He is strong in his denunciation of these people who were leading them astray. And then at the end of the letter, which is read up all the people in the church, to the elders etc. It was not a secret letter. And in chapter 4 he is addressing two ladies. 1. We cannot live with misunderstanding, and disagreements. If Paul is addressing it out must be important. If you have gangrene on the body you have to deal with it or it will destroy the whole body. Q. How did he hear about it? We don't know. But it was important enough. If we have unresolved issues we should sort it out. The Bible shows us how in Matt18:15. The starting point is talk to the person concerned. Talk about the issue. If it is sorted out, great. If not get a third neutral mature party. If not resolved yet then get a leader involved. I would like to see this practiced in the church. When Paul heard about this, it wasn’t a case of tale tattling. If there is gangrene in the body shouldn't you know about it? Let’s see how Paul handles this- Phil 4:1- out of love. They were not ordinary women. They were known to Paul for a long time. They had contended for the gospel. Contend- is the word we use for wrestle. They were mature believers. No matter how much we have served we can still get caught in disagreements and miscommunication. Acts 16:9- 12 During the night Paul had a vision of a man of Macedonia standing and begging him, “Come over to Macedonia and help us.” After Paul had seen the vision, we got ready at once to leave for Macedonia, concluding that God had called us to preach the gospel to them. From Troas we put out to sea and sailed straight for Samothrace, and the next day we went on to Neapolis. From there we travelled to Philippi, a Roman colony and the leading city of that district of Macedonia. And we stayed there several days. It shows us that the church in Philippi was not an easy church plant. Normally Paul would go to the synagogue on a Sabbath. But since there was no Synagogue, so he went down to the river. There were women there. Lydia gets saved and Paul stayed with them for some time. We note that they prayed a lot. Paul was troubled by a servant girl with an evil spirit and he commands the evil spirit to leave. This caused trouble for Paul. He was thrown into prison and severely flogged and put into stocks. Paul and Silas start praising God. An earthquake happens and their chains fall off. The jailer gets saved and his family is baptized that night. This was the birthing of the church. These women were probably there from the beginning. Paul is now pleading with them to agree with each other. He is asking the others to get involved. Q. What was the issue? We don't know. Could not have been doctrine because Paul would have addressed it. All he asks them is to be at peace. And he asks someone to intervene. He could be an elder. So we see the importance of living in peace. When you come to faith in Jesus, your name gets written in this book. Is your name in that book. If you have not put your faith in Jesus please come talk to us. Q. So how should we live? We should be able to forgive and bear with each other. Eph 4:13- until we all reach unity in the faith and in the knowledge of the Son of God and become mature, attaining to the whole measure of the fullness of Christ. We are growing in maturity, not being touchy, keeping short accounts, giving grace to each other. Accept one another, love as Christ loves us. So if we have strained relationships let's sort it out. Scriptures talks of loving, serving, bearing with each other. Let's practice this. We can't love God and hate each other. We are in deception. This week we are going through fellowship in Purpose Driven Life. Let's aim to live like this. We are very blessed. We are well, we have good health, we have food, a variety of clothes to choose from, education and shelter. We are truly blessed. 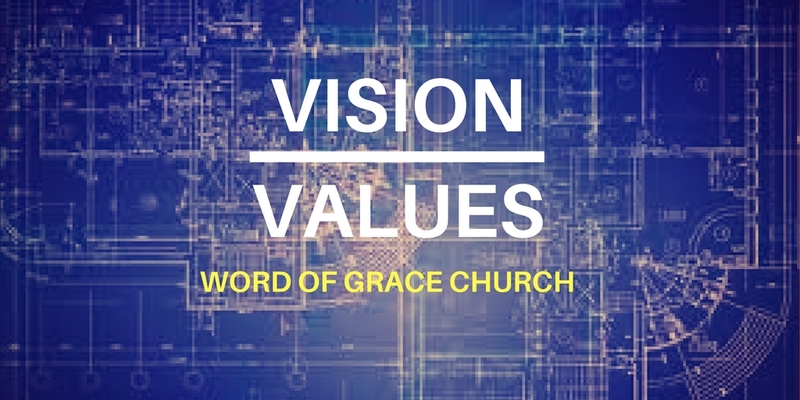 Today we will go through the vision of Word of Grace Church. The most famous prayer is the Lord’s Prayer. Matthew 6:9 onwards. The prayer of Jesus was that the kingdom of heaven would come on earth. Not only did he ask his disciples to pray for, he also did these things. As you read the gospels you watch what Jesus did. He travelled and healed the sick, cast out demons, proclaimed that the kingdom has come and called men and women disciples. Then he did what only he could do, he died on the cross and rose from the dead. Before he went to heaven he gave the great commission, to go into all the world and make disciples of them baptising them and teaching them to obey everything Jesus commanded Matt 28:18- 20. Jesus is in heaven, but his body is here on earth. Q. So how are we at Word of Grace doing that? The other side is the great commandment. We want to make disciples and bring heaven on earth. Our tag line aims to nail those- Enjoying God, Making Friends, changing lives. Let's look at loving God. This is our priority- to pursue the presence of God. It's not about singing a few songs and moving on. In Exodus 33:14-16 Moses said that if God's presence does not go with us what's the point? Q. What is it that distinguishes us from others? It’s the presence of God! We should value this more than anything else. Throughout scripture people were marked by the presence of God. When God'sPresence is with us, people notice. Will you be one who desires Gods presence? In order for this to happen we need to keep in touch with the precepts/ the word of God. That's why we have the GYM groups, IDT, etc. We seek the power of God. We don't just want to sing songs but do the stuff. One way we get joy in our life is when prayers get answered. How powerful is a prayer meeting? You can tell by the prayers that get answered. The second greatest commandment is to love your neighbour as yourself. One of the things we want to foster is good healthy relationships in the church. Your background, age etc does not matter. One way we do this is by eating together. This is something Jesus did. He had the last supper with all his disciples. He cooked breakfast when he rose from the dead. It shows that we accept them and they accept you. In our nation that is so divided based on caste we want to break those barriers down. In villages, the lower castes are not allowed to draw water from the same wells as the upper caste. We are all one in Christ. In Word of Grace, if you are new, you will almost always receive an invitation to lunch. I’ve had the privilege of visiting many countries and churches. But this one church we visited in Holland stood out. After the service, someone came and invited us for lunch at their home and it had made such a huge impact, in this foreign country where we hardly spoke the language, to be accepted into their home to eat together and spend time. Jesus didn't call us servants. John 15:15- “I no longer call you servants, because a servant does not know his master’s business. Instead, I have called you friends, for everything that I learned from my Father I have made known to you.” He called us friends. Our proof of this is as we demonstrate love to each other. Invite people and make friends. We are all different. But friendships and relationships are important. The number one problem in the world today is loneliness. You can have 2000 facebook friends, but how many will show up for their funeral. Invest your time and money in making friends. If we only did the above two we would be a happy clappy club. We have a mission- To bring heaven on earth. To be changed and to change lives. Being born again is just the first step. I have told you Abdullah's story. But they are many like that. We have a get connected course for new people. If you are new here I want to extend the same invitation to you. Come with us and we will do you good. We want to help equip you to be involved in the lives of others. 2 Cor 5:14- “For Christ’s love compels us, because we are convinced that one died for all, and therefore all died.” Jesus died for you and now he wants you to live for him. The prophetic word over us is that we will disciple people and then send them to the nations. So, this is it- our priority is enjoying God, but we don't do it alone, we are making friends. So that together our lives can be changed and the lives of others can be changed. We are here for a definite purpose to serve God's purpose in our generation. David served his purposes in his own generation. The book of Judges is full of people who served His in their own generation. In Judges 4 Deborah delivered people from their enemies. In Chapter 6 Israel was under the rule of the Medianites and the Israelites were fearful. They were farmers and the medianites would attack and take away everything. This was the context. Judges 6:1 says, because people disobeyed God and did evil. Today is the same. There is so much killing and evil. The Lord allowed this so that they would turn back to him. 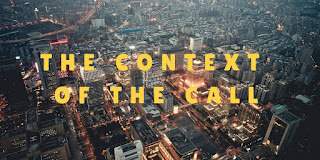 God was very much a part of the context. There was pain and suffering. People were totally drained. God heard their cry. People are groaning and crying today. There is so much noise today that drowns out peoples cries. Jesus was in crowded noisy places yet He knew who touched him. In the busyness of life can we hear people’s cries and the hurt that people face? This is the context in which we live. Petra song- It's too late for Annie but not too late for others. In Exodus, we read about Moses. People were under slavery and God heard their cry and Moses comes into the picture. The same thing happens with Gideon. God was preparing him in that context. We could have a ‘don't-care’ attitude. I'm reminded of Esther. The Jews were threatened. Word comes to Esther and she is reminded that she was born for such a time as this. If we don't act, God can use someone else. If the context does not pinch us then we can't play a role in fulfilling God's purposes in our generation. When did we last get affected by the troubles around us? Jesus was moved on compassion when amongst the people. Jesus wept over Jerusalem. Q. What does responding to God involve? In Verse 11-12. Gideon was threshing wheat in a wine press. It shows that the quantity of wheat was less. He was doing something that should have been done in the open. In this fearful context, God calls him a mighty warrior. God looks at us as people who can be strong and courageous. When God calls us to serve him he looks at us as what we will become and not what we are today. Samuel was told to anoint a king from the house of Jesse. All the sons walk by but these were not God's choice. It's the last one that God chose to be king of Israel.God has a rating. He calls us mighty warriors. Gideon in verse 13 does not accept this. He felt the situation hopeless. We might feel like this too. But God comes in. In Verse 14 God still commissions Gideon. God is sending him and he is not going alone. Give your nothing in his hand and he will make something out of it. The victory is already assured. Gideon is still not trusting. We often think God has made a mistake by choosing us. But that is not true. Be assured you have a purpose. In Verse 16, he assures Gideon- Surely I will be with you. God's companionship is guaranteed with us. God assures his presence with us through the Holy Spirit. Q. Are you discouraged today? Remember God will be with us to the end of the age. Surely we will make an impact. John Patton a missionary to an Island. Within weeks his wife was struck with fever and she died . He had to bury her. After several years he died. When he reached the island there was not even one Christian. But when he died there was not even one who was not a Christian. We saw that God is concerned for His people and he answers our prayer and He is the king who is coming again. Let's not let the mystery of Revelation over shadow the certainty in it. We are going to talk about something little more real today. 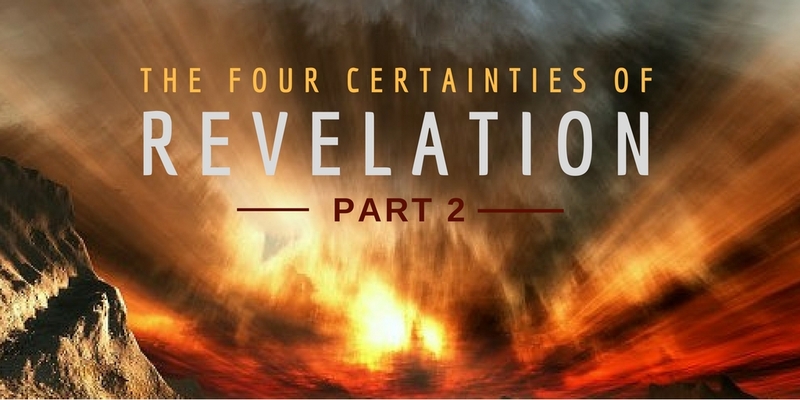 Revelation is about real people, real hardship and it raises real awareness that we should expect no different. Revelation is written by John. Rev 1:9- “I, John, your brother and companion in the suffering and kingdom and patient endurance that are ours in Jesus, was on the island of Patmos because of the word of God and the testimony of Jesus.” Companion of suffering and patient in endurance. John is not on a private island on vacation but exiled and in suffering. The churches he is writing to are mostly 7. One of them in Jerusalem was having such severe persecution that they had to flee from one city to another. The result is the gospel spread. It's a by product of persecution. 3. We are promised this that we will be hated and persecuted. Just as Jesus was persecuted they will do the same to you. Rev 6 last week we spoke of how Jesus hears all our prayers and that heaven falls silent so He can hear from His people. This was the 7th Scroll, but there were 6 scrolls before that. · We should not anticipate ease. Rev 7:14- “I answered, “Sir, you know.” And he said, “These are they who have come out of the great tribulation; they have washed their robes and made them white in the blood of the Lamb.” Is the bride immune from this? These have come out of the great tribulations. The design might be to bring judgment on those who have rejected him. Suffering is part of our life. In Exodus they have a cloud of fire and cloud. We have His presence dwelling in us. Q. How does this look in daily life? Troubles are designed to destroy your faith by the devil. But these things don't separate us from God love. But when it doesn't do that it makes us conquerors. So these things increase our faith and we thrive. These are blessings decreed by God. b. Die in the Lord. Those who complete their course to completion. When Jesus comes we are found ready because we have endured and not overcome by Templeton. Like Joseph thrown in a well, then resists temptation and stays faithful. In Joseph reigning alongside Pharaoh, we get to reign with the king of Kings. This gives is a picture and gives us a hope. It does not take away the hardship but gives hope. Heb 12:2 says Jesus endured the cross for the joy set before him, for his bride. It compelled him forward.